Editor's Note: The title of the article refers to there being 3 reviews in it. I included the most important one. Tom Petty will never have to live like a refugee again. His new album has risen to number three on the charts and he and his backup band, The Heartbreakers, are getting the recognition they deserved for so long. Damn the Torpedoes is a classic example of the work of a long-underrated artist who is finally making his move to the top. All through Damn the Torpedoes there is an intensity remiscent of Bruce Springsteen's Born To Run. While Petty is not a "rock-poet" as is Springsteen, he is no slouch at making music which hits a very emotional chord in the listener. There are several cuts which stand out on Damn the Torpedoes. Side one has "Refugee" and "Here Comes My Girl," two songs which excellent lyrics and vocals from Tom Petty, and some guitar work from Mike Campbell. Also notable on this side is "Century City," a fast-moving rocker reminiscent of the early Beatles. Side two contains the single "Don't Do Me Like That," which has now made the Billboard's top ten, the last word in popularity. The album ends with "Louisiana Rain," a rice ballad with a strong country flavor to it. After several good albums that did not sell, Tom Petty has scored a success with Damn the Torpedoes, and if you are in the market for an album full of good tunes, Damn the Torpedoes will not disappoint you. Tom Petty and his Heartbreakers soared out of the pack of New Wave artists in the late '70s and already have become a major force in the return to good ole 1960's rock & roll. Petty's music has transcended the original Punk scene and fits nicely into the class of artistic New Wave material that has gained immense popularity such as that by the Cars. The music is driving, forceful and is packed with emotion from the soul of the artist. The first time I listened closely to his latest hit, 'Refugee,' I thought I was hearing an old Bob Dylan tune. Petty's vocals in the hit single have fooled even the die-hard Dylan fan on initial listenings. Side 2 contains the hit "Don't Do Me Like That' but it side 1 that provides the best listening. My favorite is 'Here Comes My Girl' because of the excellent guitar work of Petty and co-writer Mike Campbell. The topic echoes the theme of the album which is a look at the life as Petty has seen it through the eyes of the everyday man. In this song, Petty talks about being stuck in a rut in your hometown. Somehow, things aren't so bad when he is with his girl and he can rise above all the hard work that seems to be taking him nowhere. With a lot of people still reluctant to accept the New Wave, Tom Petty and the Heartbreakers are churning out a new style that might be considered a safer alternative for some listening audiences. Tom Petty isn't new wave and he certainly isn't new, however his latest album, "Damn the Torpedoes," is one of the hottest new albums of the year. After three years on the brink of stardom, with one semi-hit "Breakdown" and even filing for bankruptcy. Petty has finally released an album so full of exuberent energy that this will probably be the one to do it for him. In fact, "Damn the Torpedoes" is No. 2 on this week's Rolling Stone Top 100 Album Chart. The title is taken from the famous quite by David Glasgow Farragut in 1864 at the Battle of Mobile Bay during the Civil War, regarding mines set by Confederate troops. The full quote "Damn the torpedoes -- full speed ahead!" is an apt description of what the album has to offer. Petty takes a lot of chances and wins with an excellent mixture of melodic mainstream rock and high voltage rock and roll. It's high-spirited sound is reminiscent of Dylan, Jagger, Springsteen and the Byrds soulful harmonies -- but all with the polished studio finesse of the 80s. "Refugee" opens side one with a bang. His paean to success is accented by the lines, "You don't have to live like a refugee." A European tour by Tom Petty may have to be postponed -- at press time it looked like the singer might have his tonsils removed. Petty planned to take a few weeks off after the close of his American tour in late January to determine whether he needed a tonsillectomy. If so, the European gates, which were to follow immediately, will be rescheduled pending his recovery. Petty's tonsils became inflamed after his Saturday Night Live appearance last November. He lost his voice after a show in Philadelphia on Nov. 13, and had to postpone a concert in Boston the following day. Another show was also postponed and three other canceled due to the throat problem, but Petty's singing on the remaining 35 U.S. dates has generally been good. Refugee (MCA): Stylish Tom Petty and the Heartbreakers proving that solid rock can be fun. Every now and then a recording artist of relatively scarce popularity puts out an album that vaults him over the wall of obscurity and lands him as a true rock-and-roll star. So is the case with Tom Petty and the Heartbreakers. 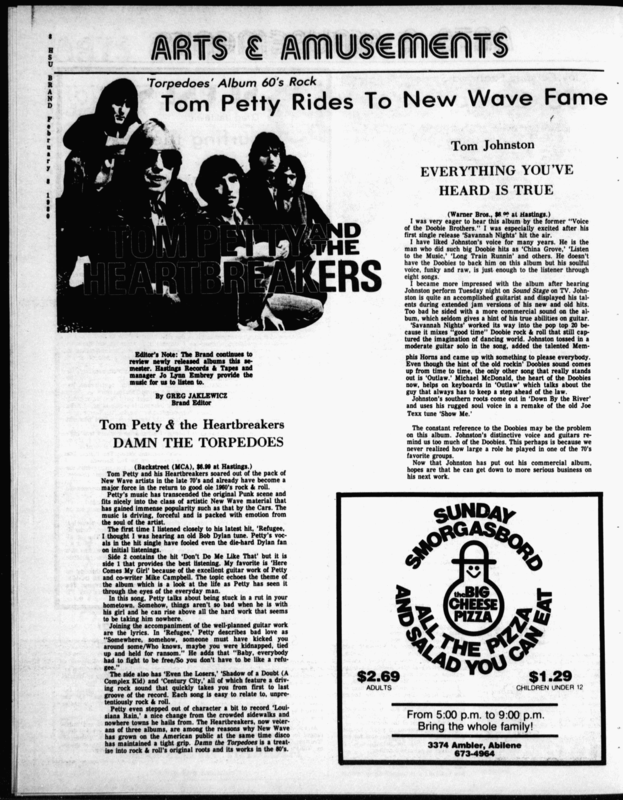 His latest album, Damn the Torpedoes, has sent Petty hurdling into the public eye. His recent appearance on "Saturday Night Live," rockering record sales, and the album's position in the upper slots of the record charts, illustrates T.P. 's sudden acceptance and popularity. 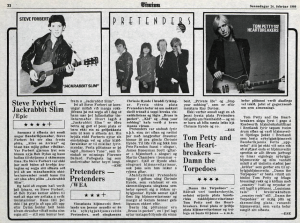 The main reason for Tom Petty and the Heartbreakers' sudden success is their impressive new album, Damn the Torpedoes. Within the album lies a brand of some very catchy, convincing rock-and-roll. The songs grow on you quickly and maintain their vibrant, fresh sound time after time. The propelling force behind Torpedoes is Petty's dynamic vocals. He is truly one of the finest rock-and-roll vocalists to emerge in years. There is a vast improvement in his vocal abilities over his previous albums. His four-octave range gives the album a crisp, relentless tone throughout, as each song draws a slightly different Petty interpretion. His accentuation, feel, and timing is superb. 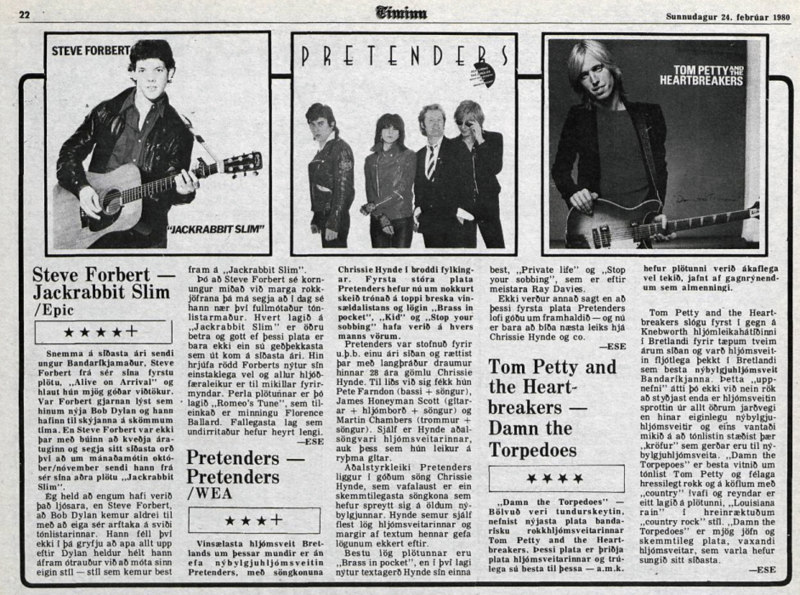 As far as the musical content of Damn the Torpedoes is concerned, the Heartbreakers have it all sewn up. You can feel the energy that the group radiates on almost every cut. However, the album is missing one sorely needed element. There are absolutely no guitar solos on the entire album. There are several songs that are just crying out for a screaming guitar solo. This is particularly true on the romantic rocker, "Here Comes My Girl," and the speedy "Century City." Still, whatever is missing in solos is compensated for by the Heartbreakers' unison, tightness, and Petty's ripping vocals. 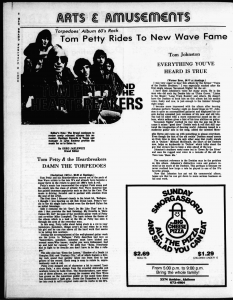 Tom Petty and the Heartbreakers have reached the high plateau of mass-accepted new wave that only few bands such as the "Cars" and "Blondie" have achieved. Damn the Torpedoes gets a solid 8 on my scale of 10. You can rest assured that "Tom Petty and the Heartbreakers" will be around for a long, long time giving us plenty of great music in the years to come. Editor's Note: This is an Icelandic article and my translation of it. If you actually know Icelandic and would like to improve it, please contact me. „Damn the Torpedoes" — Bölvuð ver i tundurskeytin, nefnist nýjasta plata bandarisku rokkhljómsveitarinnar Tom Petty and the Heartbreakers. Þessi plata er þriðja plata hljómsveitarinnar og trúlega sú besta til þessa — a.m.k. hefur plötunni verið ákaflega vel tekið, jafnt af gagnrýnendum sem almenningi. "Damn the Torpedoes" -- Damn the Torpedoes is the name of the new record by American rock band Tom Petty and the Heartbreakers. This record is the third record by the band is is probably the best so far -- the record has been extremely well accepted, both by critics and the public. This gentleman stands at the front of the new wave. And yes, this album is everything everyone says it is. (But they said that about the first Dire Straits and the first Cars album, didn't they?) Petty is to new wave what Donna Summer was for disco, a representative; perhaps more importantly, a charismatic representative. Having popularized the music a great deal, there's a lot of pressure on Petty to continue to produce. Summer has, but it's still too early to tell whether Petty can produce more tracks like "Don't Do Me Like That" or "Refugee." I think he can. De elpee, Damn the torpedoes van Tom Petty and the Heartbreakers is weer in de winkels verkrijgbaar. Er waren enige problemen door de overgang van MCA van EMI naar Ariola. The album "Damn the Torpedoes" by Tom Petty and the Heartbreakers is back in the stores. There were some problems moving from EMI to MCA Ariola.